Sorry I couldn't resist. Happy bowels make your day an life better, you know it, even if you won't admit it. This delicious breakfast bowl is filled with antioxidants and best of all it's super easy to make. 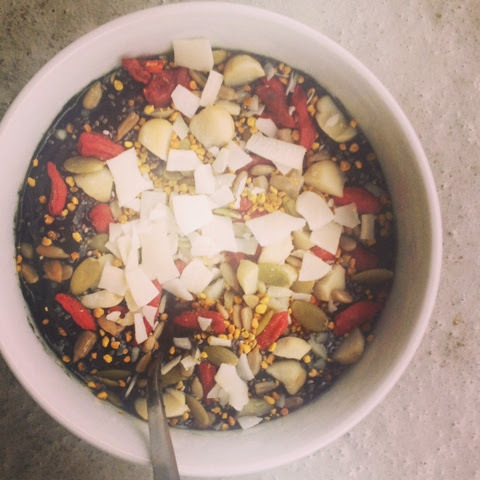 All you need is frozen fruit, nuts, seeds, dried berries, green powder, and some coconut milk. On a trip to Miami in December my friend took me to this awesome juice bar concept called Jugofresh. Although I couldn't really appreciate it at the time - I was desperately hung over and in serious need of a greasy spoon type meal. Not a post workout green healthy type of morning. Any way this place was amazing. A wicked selection of cold pressed juices and elixirs in these super cute mini glass bottles. They also had some interesting sounding dishes that until you have them in front of you are a totally unimaginable. Like a kale and coconut ceviche, raw oatmeals, and the frozen fruit bowl I made today. 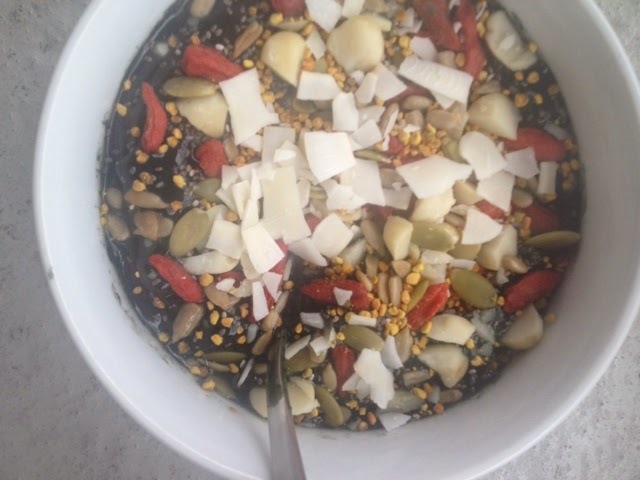 Crunchy toppings - goji berries, raw macadamia nuts, pumpkin & sunflower seeds, bee pollen, black chia, and Danielle's coconut chips. Blend the fruit and liquid, until it forms a sorbet consistency- I use a Nutribullet. Then top with a sprinkling of crunchies. That easy. You can even make your fruit puree in advance an leave it in the freezer.